Here's you a little War Story. I never made it to Ben Het. Started once but there was an ambush and the road was mined pretty bad so we turned back. When I went on my 1st Patrol, we drove in the direction of Ben Het and stopped at a bridge and unloaded. Walked to our left through a Montenard village and waded through a small river then up the mountains towards Fire Base 6. On the way up it had to have been over 100 degrees. We stopped every few minutes to rest, breath, and drink water. This was my first patrol. We had a Chopper flying up ahead of us looking for Charlie. The chopper spotted a Platoon size element coming down a trail towards us and I received a call on my radio from the Pilot. My LT took the call and we jumped back into the jungle. I was sure we were going to ambush Charlie but orders were that we had to try and get around them. There was about 50 of us. Me, the LT., a few others from our Battery and about 40 men from the Engineers there at Dak To. But we were told to make it around the VC. So we had to move out a little faster and man that sun, and heat was kicking our butts. As we got closer to FSB 6, the men from there started popping Mortars and M-79s over our heads onto Charlie because by this time he (VC) had heard us and was tailing us. Anyway, the last I remember was the FSB 6 people were firing over our heads and we stopped for a breather and I flopped down on my back, pulled my Radio off, and when the LT said....Let's go, I stood up and passed out from heat exhaustion. He came to me, pulled down my pants, opened my shirt, and started giving me water. He was asking me questions like....what's your name, where you from, etc., and all I remember was I was mumbling something so he called for the Chopper to set down and get me out of there. The Chopper must have hovered just off the ground because I don't remember there being an LZ anywhere on that hill side. A couple of men dragged me down to where the Chopper was and strapped me in a seat and threw my web gear in with me and I got a ride back to Dak To. I woke up in the Aid Station at Dak To from heat exhaustion. 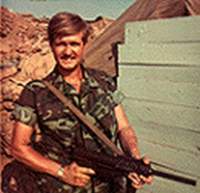 The sad part was....I was pissed because I had missed my first fire-fight and also some SOB stole my big Jim Bowie knife I had on my LBE. ha ha. The rest made it to FSB 6 and got lifted back to Dak To later. I also remember carrying that 45 Caliber Grease-Gun I had bough from some guy for $50. That was the last time, because I sold that sucker when I got back. I was carrying it along with 4 full clips of 45 Cal. ammo and the Radio. That stuff got heavy. The LT kept telling me to keep up and finally I let him carry my Burp-Gun so I could keep up in the heat. I remember those Rocket attacks at Dak To pretty well. When the 122's were hitting over in the Artillery area, we on the other side at HHB would peep out of our Bunkers and you could hear a "pop" then watch overhead and sometimes see the 122s fly over head....we called them flying-telephone-poles.